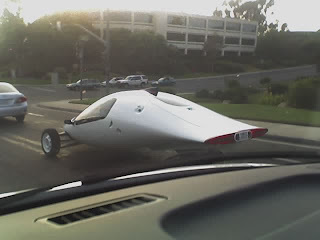 I spied this wingless aircraft on Palomar Airport Road this evening. Aptera typ-1 prototype. No fairings on the front or rear wheels, MFG plate. Unfortunately my crappy cell phone pic does not show the unshrouded rear wheel assembly. It looks like a standard single-sided motorcycle swingarm. Aptera is based here in Carlsbad, the plug-in gas hybrid version they're developing is claimed to get 120 MPG at 65 MPH - or 300 MPG if plugged in every 120 miles (if you believe everything on Wikipedia). They're going to be selling an electric version as well. Pricing is expected to be $27 for the electric or $30k for the hybrid. Oh, and it's a 2.5 seater. The .5 is a small area behind and between the rear seats for a child seat. Production is scheduled to start late this year and you have to live in California to be able to purchase it. Looks like fun. Keith, you need to get crackin' on your three wheeler. Oh, and Aptera is Greek for "wingless flight". YOu posted that just for me, didn't you?